August 24, 2018 Cactuses are going down, and Fortnite’s purple lightning is getting more and more frequent. 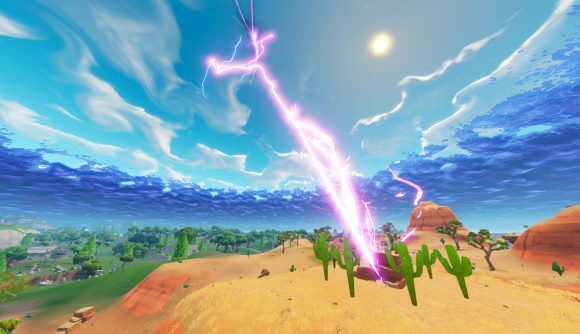 Some nasty weather is erupting out of the Fortnite rift over the past 24 hours, with massive strikes of purple lightning coming down on the map in explosive fashion. It’s become clear in that time that the strikes are targeting cacti – cactuses, if you’re rebellious – in Paradise Palms, and the last one is about to go down. What’s it all mean? That’s anybody’s guess, but it’s likely the start of the road toward Season 6, similar to how previous in-game events have gone. The smaller rifts have faded away over the past week, leaving only the one big rift in the center of the map. Of course, now that we know lightning may issue forth from that rift at any moment, it’s plenty scary on its own. The target of the strikes wasn’t initially clear, but they’ve since honed in on a cactus circle, destroying the plants one by one. Based on the timing of the strikes, it looks like we’re going to see the final cactus go down in a handful of minutes as of this writing, though nobody knows what’s happening next. The image above of the first strike comes via GhostGT27 on Reddit, though there are plenty more angles on what’s happening. Like here, here, or here – and you can even check out some video, if you’re so inclined. Before the first lightning strike landed, another player noted the return of the motel sign. Apparently, striking the newly-returned sign will send off a burst of purple lightning back into the sky. If you’ve got a pinboard, this is the time to start breaking out the red string and begin connecting the dots. Is Tomato Temple connected? What about the new Rift-To-Go? If we thank the bus driver enough, will they show us the way? For now, maybe you should just focus on the Fortnite week 7 challenges – all this speculation might just be too much.